University of South Carolina historian Lauren Sklaroff has spent years researching the life and influence of Sophie Tucker. She will introduce audiences to Tucker in a public talk, titled “Introducing the ‘First Lady of Show Business’: The Incredibly Forgotten Sophie Tucker,” at 6 p.m. March 23 in Tapp’s Art Center on Main St. in Columbia. No one knows for certain why the Clovis people and iconic beasts -- mastodon, mammoth and saber-toothed tiger – living some 12,800 years ago suddenly disappeared. However, a discovery of widespread platinum at archaeological sites across the United States by three University of South Carolina archaeologists has provided an important clue in solving this enduring mystery. The research findings are outlined in a new study released Thursday (March 9) in Scientific Reports, a publication of Nature. There’s no better place in Columbia to enjoy spring than the University of South Carolina and its iconic Horseshoe. To officially usher in the season, My Carolina Alumni Association is hosting two public events: A historic Horseshoe tour and reception with University Archivist Elizabeth West on March 9 and an evening of Southern heirloom foods and culture with Carolina Distinguished Professor David Shields on March 16. What are the keys to happiness? What is the meaning of life? Philosopher and University of Virginia professor Talbot Brewer will discuss how to find these answers in the humanities in a public talk Dec. 14. The event is offered as part of a $2.1 million funded grant project titled, “Virtue, Happiness and the Meaning of Life,” which is co-directed by Carolina philosopher Jennifer Frey. The impact that interest rates, industry trends and new presidential administrations have on South Carolina’s economy are among the topics that have drawn the state’s business leaders to the Darla Moore School of Business’ Annual Economic Outlook Conference (EOC) since 1980. More than 150 leaders will be at this year’s EOC on Thursday. Three Carolinians who attended a game in this year’s historic World Series shared their personal accounts as a Cub or Indian fan. 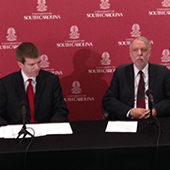 A pair of philosophy researchers from the University of South Carolina and the University of Chicago has been awarded a $2.1 million grant from the John Templeton Foundation to study the connections between virtue, happiness and the meaning of human life and society. 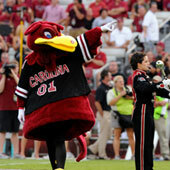 The University of South Carolina will usher in the college football season for the fourth consecutive year Thursday (Sept. 3), when the Gamecocks take on the North Carolina Tar Heels in the inaugural Belk College Kickoff in Charlotte. The season opener, which is set for 6 p.m., marks the 57th meeting on the gridiron for the two Carolina teams and the first time the two teams will battle in Charlotte. 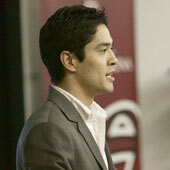 A trio of student ventures won $50,000 in prizes and startup support in the 2013 Proving Ground entrepreneurship competition. 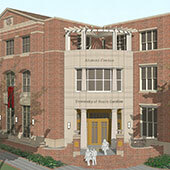 Nearly 170 years after its establishment, the University of South Carolina’s alumni association will have a new home. Officials of the My Carolina Alumni Association and the university gathered Friday (Nov. 1) to break ground on an Alumni Center, located at Lincoln and Senate streets. 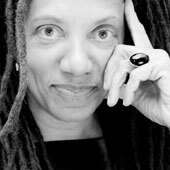 Poet and National Book Award winner Nikky Finney will deliver the University of South Carolina’s annual Adrenée Glover Freeman Memorial Lecture Thursday, Sept. 26. University of South Carolina Parking Services will operate the Gameday Shuttle once again during the Gamecocks’ 2013 home football games. 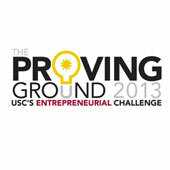 The Proving Ground -- the University of South Carolina’s startup competition for students – is back for 2013 and bigger than ever, this year boasting more than $50,000 in cash prizes and startup support.